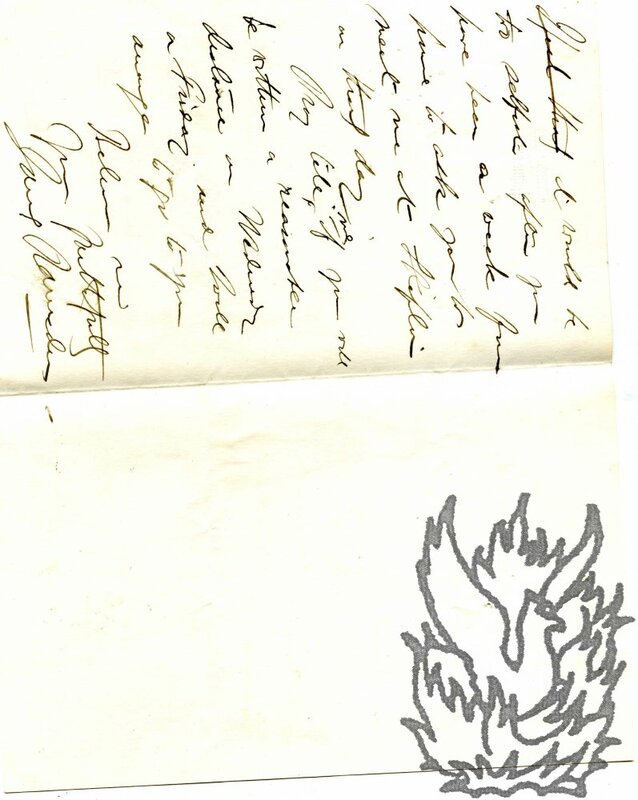 Autograph Journal of Johanna Maria Barrow, daughter of Sir John Barrow of Ulverston, describing her courtship by the soldier and artist Captain Robert Batty. [Darley Dale and Dovedale, Derbyshire.] 31 July to 1821 and succeeding days. 9pp., 12mo. In makeshift unbound pamphlet, made up of six bifoliums pinned together. In good condition, on aged and lightly-worn paper. While short, the account is vivid, its first-person account of a whirlwind Regency romance evoking the inevitable comparison with Jane Austen. Written with the long s, the journal begins: 'On Monday July 31st. Printed application by Edward Batty, son of Lieut-Col. Robert Batty and grandson of Sir John Barrow, 'To the Secretary of the Royal Agricultural Society of England', including 6 testimonials, from John Barrow, Charles Landseer, Henry Cartwright, etc. Dated from Egdean, Petworth, Sussex, 23 September 1868. 4pp., 4to. Bifolium. In fair condition, on lightly aged and creased laid paper with Joynson watermark dated 1867. The document is headed 'To the Secretary of the Royal Agricultural Society of England', and it is the Secretary's post for which Batty is applying. He describes himself as '30 years of age, married, the son of hte late Col. Batty, of the Guards, and grandson of Sir John Barrow, Secretary of the Admiralty. [Printed keepsake, with two illustrations.] In thankful Commemoration of the 90th Birthday of The Dowager Lady Barrow, January 5th, 1900. Printed by one who owes much to her loving spiritual help and letters when he was an Eton Boy in 1845. 4pp., ,4to. Bifolium. Printed in gold on shiny art paper, with the two illustrations in black. In good condition, on lightly-aged paper. The recto of the first leaf carries a memoir of Lady Barrow, 'Reproduced, by permission, from "The Surrey Comet," Dec. 25, 1899. ': 'LADY BARROW - nee Rosamond Hester Elizabeth, daughter of the late William Pennell, Esq., Consul-General in Brazil - was born January 5th, 1810, and was the twenty-first child of her parents. Six weeks after her birth she became the adopted daughter of the Right Hon. John Wilson Croker, who had married her eldest sister. 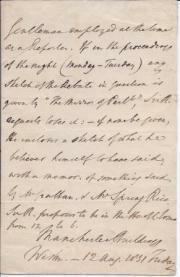 Autograph Letter in the third person from Sir Robert Inglis to 'Mr Barrow' [J. H. Barrow, editor of the 'Mirror of Parliament'], regarding a recent speech by him in the House of Commons. 12 August 1831; Manchester Buildings, Westminster. 12mo, 2 pp. 24 lines. Text clear and complete. He finds, 'upon reconsideration', that the conversation he referred to that afternoon took place two days later, and regrets that he gave Barrow 'the unnecessary trouble of sending for papers in error; & possibly attributing an inattention to the Gentleman employed at the time as a Reporter'. 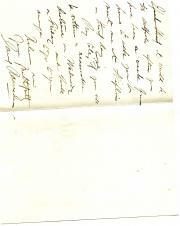 Autograph Letter Signed ('James Ramsden') to 'Mr Thompson'. 6 August 1882; on letterhead of Furness Abbey, Lancashire. 12mo, 2 pp. On bifolium. In fair condition, lightly-aged and creased. Discussing arrangements for a meeting with Thompson before 14 August, the date of the 'Furness general meeting', after which he is going on 'a months cruise'. Autograph Letter Signed ('J. Henry Shorthouse') to 'Mr. Barrow'. 27 April 1882; on letterhead Lansdowne, Edgbaston. 12mo, 3 pp. Very good, with a strip of cream paper from previous mounting adhering to the blank verso of the second leaf of the bifolium. He has 'received a Catalogue of the Friends Book Society's Annual Sale held by your and Mrs Barrow's kind invitation'. He and his wife 'should have enjoyed being present very much: if for no other reason, yet in remembrance of thirty years ago, when I used to enjoy the Sales exceedingly', but they will be 'in London on the day fixed'. Shorthouse was born into the Society of Friends, but joined the Church of England.